For entities that require outstanding presenters. Developing dynamic business-meeting presenters is an investment in your organisation’s intellectual capital. The Business Presentation Skills Courses provide you with up to 14 professional-level presenters from each course. Because audiences are expensive to assemble, developing high-quality speakers and presenters is essential. Confident, expertly skilled presenters convert audiences into valuable company assets. Skilled presenters x audience size = Intensified value. Poorly skilled presenters x audience size = Intensified loss. Speak•NZ present their conference workshop, ‘PowerPoint for Professionals’. Becoming a confidently effective presenter is magic for anyone’s self-esteem. That’s partly why most of our clients offer the course to everyone. Can you identify your organisation’s presentation-benchmark? Do your average meeting leaders’ presentation skills reach excellent? No? Speak to us about resetting your quality-‘tipping point’. Interaction, collaboration and trust are at the heart of the course. Clients routinely observe how much they value the lasting professional cross-department relationships this establishes. you and other participants who fully participate in their course; who subsequently reasonably implement its precepts, will be widely regarded as noticeably accomplished presenters and communicators. 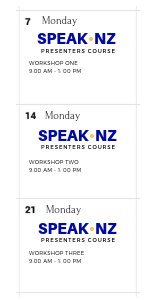 Speak•NZ has conducted up to 10 courses (30 workshops) for us throughout New Zealand each year since 2011. They adapted to our culture perfectly from the outset and continue to return excellent participant performance and feedback. 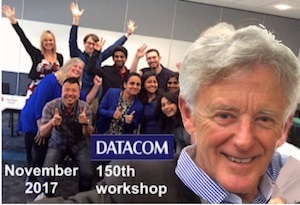 Why 3 (or 4) half – day workshops, a week apart? Half days are more effective, more efficient instruments than 2 day back-to-back courses for this intense style of learning. The gap-week between each workshop encourages quality preparation for the formal presentations participants will deliver. 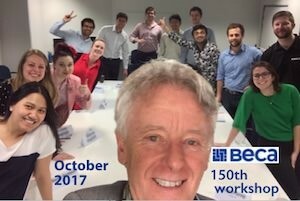 They appreciate having that time to reflect and to collaborate with colleagues. It’s easier for staff to organise 4 disruption-free hours per week than having to stop work for 2 full days. The course format is based on cognitive psychology principles, our extensive teaching and speaking experience and collaboration with clients and partners. Each group works in a fine-tuned coaching environment, alive with authentic experiences and vivid examples. There’s little background academic theory and zero voice or breathing exercises. We don’t submit people to tedious small group role-plays. More on the course format ..
Strong group communication skills are essential to our national operation. 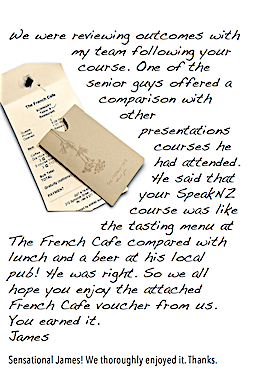 Our monthly scheduled Speak•NZ courses ensure as many of our people as possible become excellent presenters. They, in turn, motivate colleagues to enhance our effectiveness and reputation.